Many conditions affect the knee joint and cause symptoms. Pain is the predominant symptom from most knee complaints. It is usually fairly well localised within the knee but can be more widespread and can sometimes also be felt in the shin area. Ligament injuries, patellar instability and some cartilage tears can give rise to a feeling that the knee will give way (instability). Cartilage tears are painful and may cause the knee to ‘lock’. Swelling of the knee is a common symptom in any condition and can be quite impressive. Limping is common with any painful condition of the knee. Information on each of these conditions can be obtained by clicking on the appropriate tab at the top of this page. 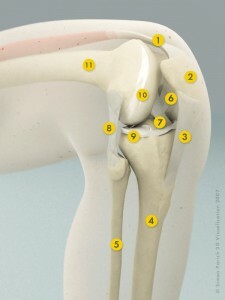 The following basic knee anatomy provides a helpful reference for these pages. The knee is a complex hinge joint that also allows some gliding and some rotation. Whilst the inside of the knee joint is continuous, it is divided into three compartments which are summarised in more detail in the table below. The bones of the knee are the femur (thigh bone), tibia (shin bone) and patella (kneecap). The surfaces of these bones within the knee are coated with cartilage (articular cartilage) which is very smooth. Between the femur and tibia the medial meniscus and the lateral meniscus (a specialised form of cartilage) help to distribute load, absorb shock, stabilise the knee and aid in lubrication. The knee joint is also lined by synovium, which produces a lubricating fluid.